The harmolodic guitar master, James Blood Ulmer was born in St. Matthews, South Carolina and taught to sing and play guitar by his father, who fronted a gospel group called the Southern Sons. At seventeen, James moved to Pittsburgh where he backed doo-wop groups like the Del-Vikings and worked with organist Ernie Goldsmith. After a stint with Jewel Bryner`s hard working Swing Kings, he took off to Columbus, Ohio and hooked up with organist Hank Marr, making his recording debut on Marr`s Sound From The Market Place on King. With his mind blown open by John Coltrane, Archie Shepp, and Pharoah Sanders, James soon moved to Detroit to form Focus Novii, a progressive jazz combo. While working the jazz lounge at Detroit's Twenty Grand Club, Blood caught Funkadelic tearing it up in an adjacent lounge. Thinking at the time that he was more advanced than the p-funksters because he was playing jazz, it didn't hit him right away that perhaps it was the other way around. 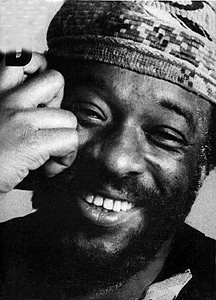 Relocating to New York in 1971, he landed a gig at Minton`s Playhouse, the birthplace of bebop, and was soon playing with Coltrane, and drummer Rashied Ali's quintet as well as with John Patton, Joe Henderson and Larry Young. Then the atom bomb hit: Ulmer hooked up with Ornette Coleman, line and sinker. Playing and living with Ornette, Blood was initiated into the harmolodic theory which freed his playing from the usual standard chord progressions. Although he never recorded with Ornette`s group, he toured extensively with them. With the help of Coleman, he recorded his first record, Tales Of Captain Black. Opening shows for Captain Beefheart and Public Image Ltd., James developed a killer band featuring Amin Ali on bass, Ronald Shannon Jackson and Calvin Weston on drums, Olu Dara on trumpet and Arthur Blythe, David Murray, and Oliver Lake on saxes. Landing a record deal with Columbia, Blood cut the mind blowing Black Rock and Odyssey and soon formed Phalanx with George Adams and the Music Revolution Ensemble with David Murray. After years of riding his funk/punk/jazz/melt-in-your-mind synthesis, James started laying down the blues, and after a pair of albums in the newly-discovered genre, he recorded his first record of non-original material at Sun Studios in Memphis. The results were staggering: His brilliant guitar playing and beautiful singing met at the crossroads of funk, blues and rock to create Blood`s decapitate-your-head version of the blues, guaranteed to create a disturbance in your mind so bad that you will be down on you knees screamin' for canned heat! At the first Stomp, James Blood Ulmer got together with Jody Williams, Sam Carr and King Lloyd for a set of blues that was more explosive than a so called moab bomb. At the 2nd annual Stomp - with Jamaaladeen Tacuma and G.Calvin Weston supllying the monstrous bottom behind James, James revisited his insanely crazed days of the "tales of captain black and his adventures of black rock." -- Dr Ike.